Great job! What pattern did you use for the gloves? And what yarn? 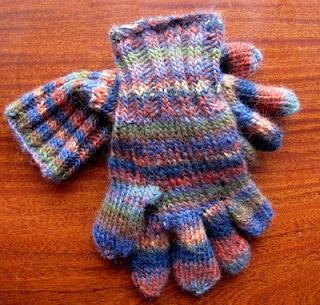 I love the colour-way and I'm very impressed by the gloves -- I've made one pair of gloves with fingers and I haven't attempted a pair like this. don't mind me -- apparently I can't read, as I just realized you said "no pattern". *headdesk* I need sleep, that's my only defense. Sorry about that. hehe, no worries, happens to me all the time. I used "freedom spirit" 100% wool by Twilleys of Stamford. I should learn to follow patterns cause both gloves aren't exactly the same and I'm terribly forgetful.